As one of the eight contemporary artists enlisted by IKEA to design pieces for their fourth annual Art Event, the two-person Coarse studio created a new character for production as a limited edition glass figurine. Aesthetically reminiscent of the duo’s Cold Ways creations, the allegorical visual narrative which this new design is actually intended to be part of, this fox character’s story diverges from the tale that’s already been told. In 2002, German artist Mark Landwehr began working on a sculpture he titled flake and fluid, figurative renditions of a skateboarder and a surfer respectively. After months of sculpting, casting pieces in resin, hand-painting them, and sewing clothes, photographs of the finished works were published in Lodown Magazine, which attracted the attention of Vans, who finance a production version of the pieces a year later. And thus Coarse was born. But it wasn’t until 2007, when Sven Waschk joined the studio, that things started coalescing towards their current direction. 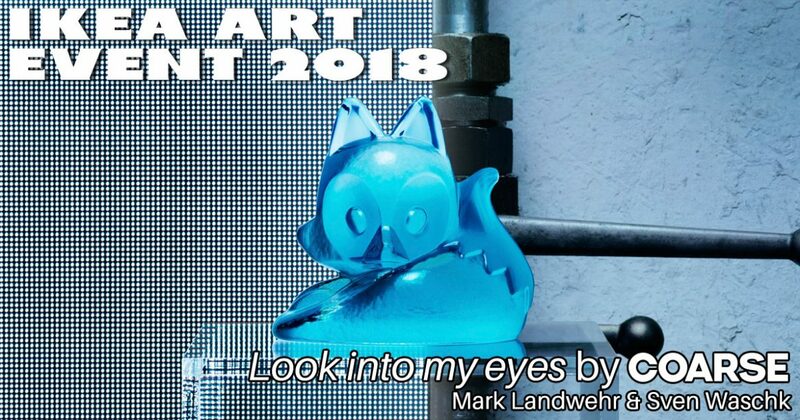 A year later, with the False Friends exhibition, Landwehr and Waschk unveiled their first non-human character and began creating pieces as a form of storytelling, aspects that have guided the duo ever since, including their recent Cold Ways period of works. With focal characters Raccoon and Fish first introduced at 2014’s Prisoners Beside Me exhibition, Waschk notes that, “in the Cold Ways universe, we like giving our animal characters everyman titles that strip them down to their most basic selves”, thus allowing “us to give the narrative a classic, fable feel which contrasts with our stories’ dark and mature themes”. With the tale behind these characters unfolding initially through a short story accompanying their limited edition vinyl set Permanent Guest (2015), this was expanded upon the following year with the Cold Ways exhibition and the coinciding debut of their saga’s eponymously titled novella. As for their design for the IKEA Art Event 2018, the duo “consider the fox to exist somewhere on the edges of the Cold Ways narrative”, explains Waschk. “She is a creature [that] Raccoon and Fish might have passed on their long journey”, he elaborates, “but she has too many worries of her own that she never would have let herself get wrapped up in their doomed voyage”. This is the final article in the series “IKEA Art Event 2018”. The fox just looks like a poop emoji. The artist lost sight of the bigger picture, particularly the silhouette of the piece.